Hey there readers! Thanks for stopping by the le vanguard blog. I hope you find this post interesting. So anyway for those of you who didn't know there was a Bushiroad festival held at Suntec City on the 24 and 25 of September. For those of you who did go for this event i hope you guys and girls enjoyed it as much as i did. We all probably still have the blue or purple stamp marks on our arms (damn they are annoying when you try and get it off) from the Cardfight Vanguard and Weis Schwarz events held on their respective days. There were tons of prizes that were distributed on these two days. An example of these loots would include limited edition deck cases from the mini games there, mouse pads, PR cards and files. It was also the only time where players could grab the Fighters Collection 2013, a extinct booster that is high on demand. Despite the long queue in the morning and the countless hours of standing, I personally feel that the wait was well worth it as i managed to snag the deck cases as well as the shirts and other prizes. Overall it was time well spent as not only did i get to fight fighters from all over the nation, I could also get some sweet deals for boosters and other TCG products. I mean where else can u find a promotion that says $10 for 5 boosters? 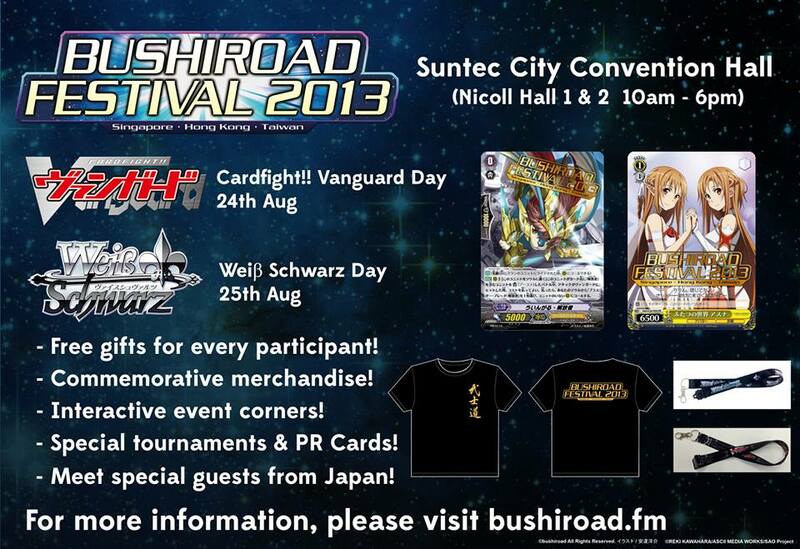 I highly encourage you guys and girls to come down to these events held by Bushiroad in the future as they are not only enriching for your Vanguard or Weis Schwarz journey to gain experience but these events also act as a platform to make new friends and to learn more about the games. Thank you for reading this post and we hope to meet you guys in person during the next official Bushiroad event.